So apparently Jim Carrey's latest movie role has troubled him. He has had a change of heart with respect to the level of violence portrayed in it. 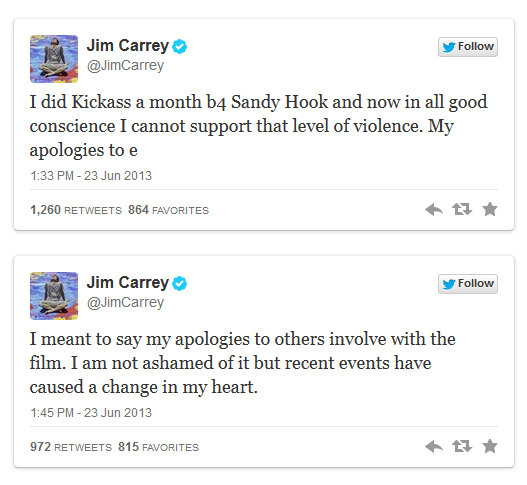 You surely didn't act in this movie for free, did you Mr. Carrey? If the level of violence in this film is something you "cannot support", tell me, is this film something you're going to let support you? Shredder... Is a White Guy? "Man of Steel" Brings the Fight! DC vs Marvel at the Movies - Who Wins? Thoughts on the Upcoming "Man of Steel"